NECROMANCING THE STONE signs to Metal Blade Records! 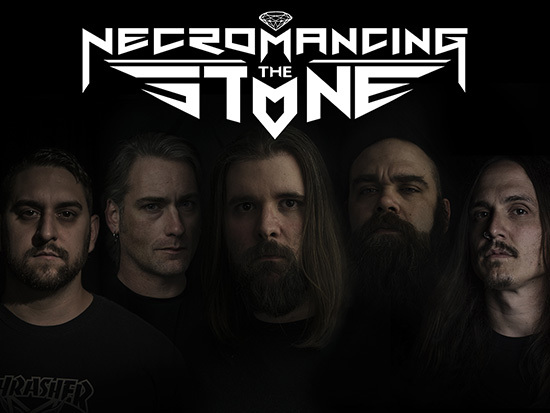 Metal Blade Records is proud to announce the signing of NECROMANCING THE STONE! Featuring former and current members of Arsis, The Absence, The Black Dahlia Murder, and Brimstone Coven, NECROMANCING THE STONE may be considered a “supergroup” or “studio project” by some, but that is not the intent of this quintet. Upon unleashing their upcoming debut full-length in 2016 via Metal Blade, the band plans to take their unique brand of no-nonsense, traditional heavy metal out on the road. For a preview of what’s to come, fans can stream and purchase NECROMANCING THE STONE‘s 3-track EP, Before The Devil Knows You Are Dead, now on Bandcamp. Released in summer 2014 and mixed by Peter Tagtgren (Hypocrisy, PAIN, etc. ), Before The Devil Knows You Are Dead will be re-recorded and included on the band’s currently untitled album. Stay tuned for more news about this release coming soon!